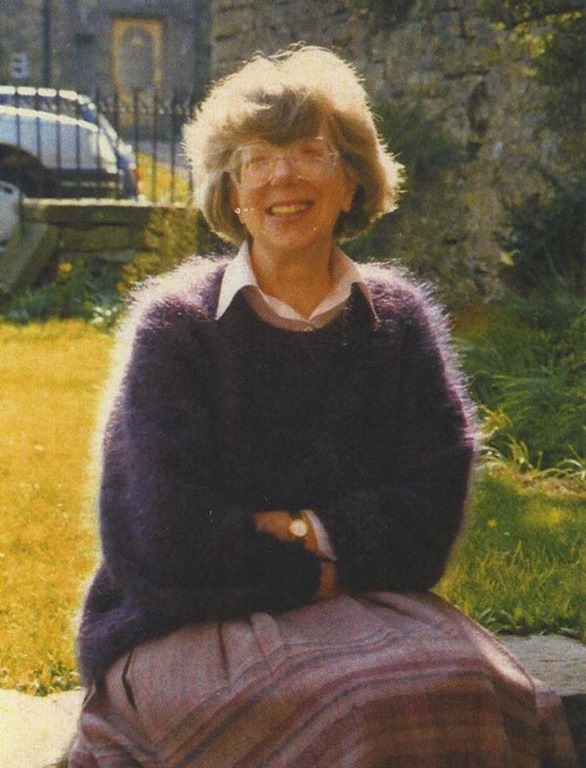 Many gathered at St Andrew’s church, Aysgarth, on Friday, April 10, to say goodbye to Hilary Kathleen Davies (1933-2015). The Wensleydale village of Thornton Rust where she had lived for so long, was almost empty as so many of the residents attended the service of thanksgiving for her life. Here is what the Rev Canon Sue Whitehouse, former vicar of Aysgarth, told us about Hilary. Several of Hilary’s friends have contributed their thoughts and memories to this service – not least Cordula from Germany. Over the last years she and Hilary have been very good and close friends and although Cordula is not able to be with us today I know that she is putting aside this hour to be here in spirit. And so we come to say our farewell to someone who from 1972 – when the then headmaster of Wensleydale school took her on a tour of the outlying farms to show her where some of the pupils lived – she was totally committed to Wensleydale: to its young people and families; to church and choirs; and to its countryside and nature. The photograph on the front of the service sheet (above) shows a Hilary of earlier days: always busy, coming home from school, taking Honey (her dog) up the Outgang in Thornton Rust, having tea with her parents, and then out to meetings or choir practices. And, in the early days of retirement she was still busy: at the Citizens Advice Bureau, as churchwarden at St Andrew’s, at the Mission Room in Thornton Rust, with the diocese and the deanery synod, and with various choirs, courses and expeditions abroad. Or she was looking after her parents in to their very old age. As she became more and more physically limited she found life very hard and frustrating and difficult to accept. And so it was, of course, difficult for those around her. But throughout her faith sustained her and she was prepared for her dying. She often spoke with Cordula about death – peacefully and without fear. So as we come to hand Hilary back into the arms of her Maker we do so in sadness as we remember times past, in gratitude for having known her and in trust of God’s promise in Jesus’ death and resurrection of eternal life for her, now in God’s nearer presence, and for ourselves, as we continue our earthly journey. Hilary was born at Low Fell in Gateshead in 1933. During the war when Gateshead was in danger of being bombed she stayed with her Grandma Sharman in Stocksfield, County Durham. And, although her love of Wensleydale became deeply ingrained she still always held a light for the north-east and the Lambton Worm was one of her party pieces. Animals were always an important part of her life, culminating in Sam (Samson) – rescued as a kitten from a wall, I think, along Thornton Rust Road, and (became) very much part of her life at The Bield (Hilary’s home in Thornton Rust). Her love of music was fostered at Gateshead Grammar School according to her friend, Ann. Hilary went on to read Botany and Bacteriology at King’s College which became Newcastle University. As a child Hilary had poor health and Betty Cawte remembers that her mother worried about her taking part in field expeditions. Hilary, of course, continued to organise school field trips when she was teaching. On one occasion Hilary needed some flower specimens for a lesson at school and so took them to Ditton Priors. Nearby was a “hush hush” secret naval base which had been served by a now overgrown branch line. Ted, a railway buff, explored the line while Hilary and Margaret gathered the flowers. The next day at school, Hilary was visited by two men who, on a tip-off, had travelled up from London in order to question her as to why she had been in the area of Ditton Priors. They fortunately accepted her explanation! In 1964 Hilary moved to Cartwright School, Solihull, and then in 1972 to the Wensleydale School where she became a Deputy Head and helped to steer the school through some difficult and stressful times. She was always a devoted and loyal member of staff who was understanding and encouraging. She continued to take an interest in all her former pupils, several of whom recently cared for her in hospital and at Sycamore Hall (Bainbridge). She was generally interested and concerned about people. She delighted in her family – her cousins and their families: Sybil and Michael; Donald, Christina, Joseph and Erin; Neil, Penny, Martha and Peter; Paul, Judith, Owen and Hugh; Valerie and Eric and their family, and latterly, in particular, enjoyed and talked about their visits. She was a kind and caring godmother and had a great capacity for friendship. Margaret Carlisle from the States said that “though there were thousands of miles between our homes – when we saw each other we would share endless cups of tea from the little blue teapot, as we laughed and cried together, consoled and advised each other, and caught up with all our news.” And, for others too like Cordula, the “little blue teapot” was an important symbol of a special friendship. Hilary always remembered people. When Jackie was helping her to sort out decades of theatre and concert programmes, Hilary would always know who had been performing in the play or concert and which friends she had been with to see a performance. In her last years she was grateful to friends and neighbours like Ian at Thornton Rust and the staff at Sycamore Hall who helped her through difficult times. Hilary’s faith was a constant throughout her life but it was not static. As a member of St Andrew’s and Thornton Rust Mission Room she worked indefatigably on practical matters but also had a vision of God’s Kingdom beyond the parochial. She looked to build on the past and move forward into the future. There was always an integrity and wisdom in her thinking and in all aspects of her life as sense of “One who serves”. Her spirituality was, I think, both nurtured and expressed through her singing, her artistic talent and her love of nature – using her gifts in praise and thanks to God. Over the years she sang with many choirs: the church choir at St Andrew’s where she encouraged youngsters in their RSCM awards; the North Yorkshire Chorus with whom she went on tours in Finland, East Germany, South Carolina and France; the Harp Singers; and in the 1990s there were special pilgrimages to the Ancient Churches of Asia Minor, Rome and in the footsteps of St Paul with the BBC Pilgrim Choir. She missed her singing with choirs very deeply and used to sing along to familiar works on her CDs. She was always interested in discovering and exploring the natural world. At Sycamore the birds coming to the feeder at her window gave her great delight every day and indeed she was sitting looking out of her window when she died. Her artistic talent was put to use in children’s work and displays for the church. The toddlers’ rainbow of glue and tissue paper was in her airing cupboard for three days before it dried out. It is poignant at this Easter season to remember that the egg rolling that took place this last Sunday was originally Hilary’s initiative – a symbol particularly for her of resurrection life. For all of us the Easter message of freedom, release from the restrictions that hold us back from the full life that God offers begins in the here and how. For us there are still earthly boundaries but for Hilary (there is) the wide vista beyond the known harbour. We are called to lead our earthly lives within the dimension of the promised state – for Hilary it is now a reality. and thank you very much, dear Pip!